The 45th annual meeting of the Phytochemical Society of North America (PSNA) was held July 13-August 3, 2005 in La Jolla, California, USA. The meeting was hosted by the Salk Institute for Biological Studies. The theme of the meeting was - Integrative Plant Biochemistry as we Approach 2010. The focus was "to celebrate the past accomplishments of the PSNA and its focus, the growing importance of phytochemistry and plant biochemistry to the public, and to set a course for the future, by linking the past with the present and attracting a wider breath of scientists and disciplines to the society." Each chapter in this volume concludes with a short summary and addresses the expected future directions of the work. 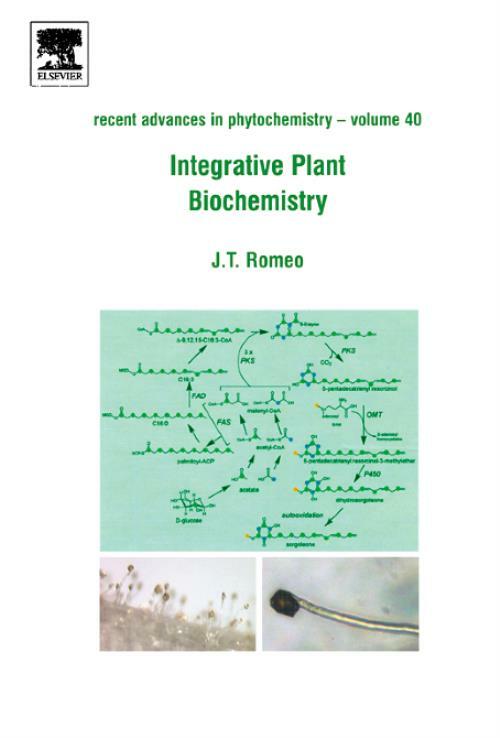 The series marks the transition and progression of the dramatic integration of classical phytochemistry into molecular plant biology. 1. Terpene Indole Alkaloid Biosynthesis. 2. Pathways to Diverse Ergot Alkaloid Profiles in Fungi. 3. Compartmentalization of Plant Secondary Metabolism. 4. Comparative Genomics of the Shikimate Pathway in Arabidopsis, Populus trichocarpa and Oryza sativa: Shikimate Pathway Gene Family Structure and Identification of Candidates for Missing Links in Pehnylalanine Biosynthesis. 5. Tomato Glandular Trichomes as a Model System for Exploring Evolution of Specialized Metabolism in a Single Cell (E. Fridman et al.). 6. Anacardic Acid Biosynthesis and Bioactivity. 7. Molecular and Biochemical Investigations of Sorgoleone Biosynthesis. 8. Biosynthesis of Terpenophenolic Metabolites in Hop and Cannabis. 9. Engineering Pathway Enzymes to Understand the Function and Evolution of Sterol Structure and Activity. 10. Methylation and Demethylation of Plant Signaling Molecules. 11. Recent Advances in Auxin Biosynthesis and Conjugation. 12. Auxin Biology and Biosynthesis. 13. Translational Opportunities in Plant Biochemistry.